Arsenal manager Arsene Wenger has been fined £2,500 and warned about his future conduct at a Football Association disciplinary hearing. Wenger was charged in relation to comments and behaviour in a row with referee Steve Bennett at half-time in the draw with Portsmouth in December. He denied the charges and requested a personal hearing. Wenger was fined £10,000 in December after a touchline bust-up with ex-West Ham boss Alan Pardew in November. Wenger was unhappy about the free-kick that led to Noe Pamarot's opener in first-half stoppage time at the Emirates Stadium and after complaining to the fourth official the Frenchman continued his argument as he headed down the tunnel. He was sent to the stands for the rest of the match by referee Bennett. A date, meanwhile, has yet to be scheduled into a separate charge of improper conduct and/or bringing the game into disrepute following Wenger's media comments about one of the assistant referees in the Carling Cup final against Chelsea on 23 February. 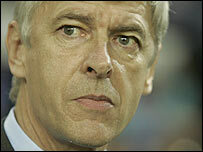 The Gunners boss reacted furiously to being charged over the clash with Bennett. He said: "I will not accept any charge. It is scandalous." Wenger added at the time: "I think I am big enough to say when I am wrong and big enough to accept it but on this particular incident I don't accept what has happened. "I complained because I didn't feel it was a free-kick but I didn't use any bad language."